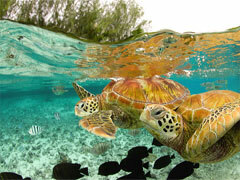 Green Sea Turtles in the waters of Bora Bora, Tahiti are seen swimming and enjoying underwater life. Vivid colours and detail make this screensaver a favorite. Have high-fashion models right on your computer screen! Download these high-end screensavers today! Get professional-quality photographs of high-end models! Download these screensavers today!